Home > Problems > What if Your Home is Repossessed? Having your home repossessed has to qualify as one of the most horrendous things that can happen to anyone during the course of their life. It can be even more distressing if having your home repossessed was brought about by circumstances beyond your control. 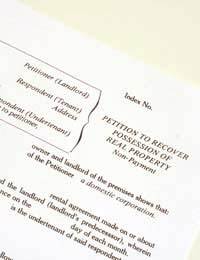 Here we look at the reasons for repossession and ask what can be done to avoid it. In simple terms repossession is when your mortgage lender – be they a bank or building society – decide that they can no longer reasonably recoup the money they have lent you as a borrower to buy a property. If this is the case then the lender will approach the courts in order to have a possession order issued which will be followed by an eviction order. What is a Possession Order? This is the beginning of the repossession process; in essence the lender has asked the magistrate to rule in their favour as you have either (a) made no attempt to contact them with reference to the outstanding arrears or (b) cannot reasonably expect you to make the repayments because of problems with finances such as bankruptcy. When a possession order is made you will be asked to appear before a magistrate in the presence of a representative from your mortgage lender and at this time you will have the opportunity to state your case for repayment at a lesser amount providing you can prove that your income is sufficiently low enough to justify it. It is at this point the mortgage lender can either agree or disagree to accept any revised payment plans you put forward however if a magistrate feels you have no other means of paying the arrears he or she may overrule the mortgage lender and instigate a Suspended Possession Order. What is a Suspended Possession Order? A Suspended Possession order is issued by a magistrate at the time of your appearance in court. If he or she feels that you have no other reasonable means of income they may decide to allow you more time to resolve the issue of your arrears. If this happens a Suspended Possession Order is granted, meaning that the mortgage lender must give you time to clear the arrears backlog before they can continue proceedings for repossession. If however during the period of this Suspended Possession Order you fail to make the payments as agreed the mortgage lender can reinitiate proceedings and seek to move for an eviction notice which, having failed to make the relevant payments, a magistrate will more than likely agree to. What is an Eviction Order? An eviction order is the final process of the repossession chain. At the issuing of an eviction order the magistrate will tell you the date on which you will have to vacate the property. If you have not left the property by this date a court appointed bailiff along with an estate agent will visit the property and, if necessary, forcibly remove you. You should be aware that it is regarded as a criminal offence to obstruct a court appointed officer going about his or her business. If you have not vacated the property on the date of eviction then you will be required to take whatever you can and then return on an appointed date with a court officer for the removal of the rest of your belongings. If you are behind with your mortgage repayments the first thing you should do is contact your mortgage lender and explain your situation. If the lapse in repayments is a temporary setback then they will reasonably offer you some more time to make up the difference. If this is agreed to they will send you a letter confirming this. You should also make notes of who you spoke to and when and what was the outcome of the communication. If you foresee that your problems with finances will last for a longer period of time then you should make every attempt to come to an arrangement with your mortgage lender. If necessary put together a repayment plan and submit it to them. If it is not acceptable to them they will communicate this to you in a letter and may also offer you an alternative. One of the most important pieces of advice however that we can offer is not to ignore such demands for outstanding arrears. If the problem is a genuine one then you should make every effort to come to an arrangement with your mortgage lender before it reaches any of the stages we have detailed here.